"The 19th century belonged to England, the 20th century belonged to the US and the 21st century belongs to China. Invest accordingly." This comprehensive resource presents the views of China's most highly respected economists, bankers, and policy makers--along with opinions from Western authorities--on the current state of banking and finance in China. Tracing the history of China's banking and finance system and looking toward its future, the book offers valuable insight for financial service providers, bankers, private equity and hedge fund managers, and equity research and credit analysts. Wang Dongming — Chairman, CITIC Securities Co., Ltd; and many more! ZHU Min is Group Executive Vice President of the Bank of China, responsible for group finance, internal control, legal and compliance, strategy and research. He joined the Bank of China in 1996, and led the group restructuring and the US$15 billion IPO in 2006, and the Bank of China Hong Kong restructuring and IPO in 2002. Prior to joining the Bank of China, Mr. Zhu worked as an Economist at the World Bank in Washington, D.C. for six years, before which he taught economics at Johns Hopkins University and Fudan University. Mr. Zhu received a Ph.D. and an M.A. in economics from Johns Hopkins University, an M.P.A. from the Woodrow Wilson School of Public and International Affairs of Princeton University, and a B.A. in economics from Fudan University. CAI Jinqing is a partner of Brunswick Group, an international financial communication firm. She advises multinational corporations and Chinese companies on strategic communication issues as well as on cross-border Merger & Acquisition transactions in the region. From 1993-2002, she worked in New York and Hong Kong in management consulting and venture capital focusing on China investments. Ms. Cai graduated from Wellesley College with a Bachelor of Arts degree and obtained her Master of Public Affairs from the Woodrow Wilson School of International and Public Affairs of Princeton University. Martha Avery is President, Avery Press, Inc., which works with Chinese publishers and individuals in bringing Chinese intellectual property to a western market. She served as General Manager for John Wiley in China from 1982 to 1990, following four years in the Commerce Department handling China trade in the 1970s, an MBA at the Wharton School, and a period in Warburg Paribas Becker in Wall Street. She established the Publishing Program for the Soros Foundation in Mongolia, and went on to serve in the Budapest offices of OSI. Throughout her career, Ms. Avery has continued to translate Chinese fiction and non-fiction and to author books. Chapter 8 China's Restructured Commercial Banks: Nomenklatura Accountability Serving Corporate Governance Reform? 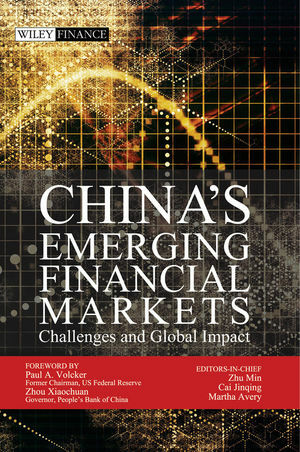 …This collection is a good bookshelf companion for bankers and investors actively participating in China’s markets. It’s also a handy cheat sheet for those who have an upcoming meeting with Chinese officials and want to understand their views."